Visit Books Free online at BooksFree.com and see why they are often referred to as the Netflix-for-Books. After signing up, browse the Web site and select titles you would like to add to your queue by clicking the red Add button. They automatically ship the number of titles your membership plan allows. The remaining titles in your queue will be ready to ship in future orders. Save on your next purchase from BooksFree.com with Books Free discounts, Books Free coupons, Books Free promotions and Books Free savings from 58coupons.com. Check out BooksFree and you can take advantage of free shipping both ways. Click link to look. Save 25% on first months membership fee at booksfree.com with this coupon code. Savings of 20% off your first month at Booksfree.com. Click code to save now. For the price of 2 new paperbacks you can rent unlimited paperbacks for $10.99 per month from booksfree.com. Enjoy Free Shipping both ways. Click link to start. 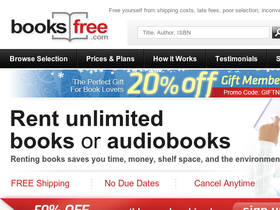 Enjoy unlimited MP3/CD Audiobooks for only $13.49 per month from Books Free. Free Shipping both ways. Click to view. Rent an unlimited amount of Children's Books for only $13.99 per month at Books Free. Enjoy Free Shipping both ways. Click link to view.